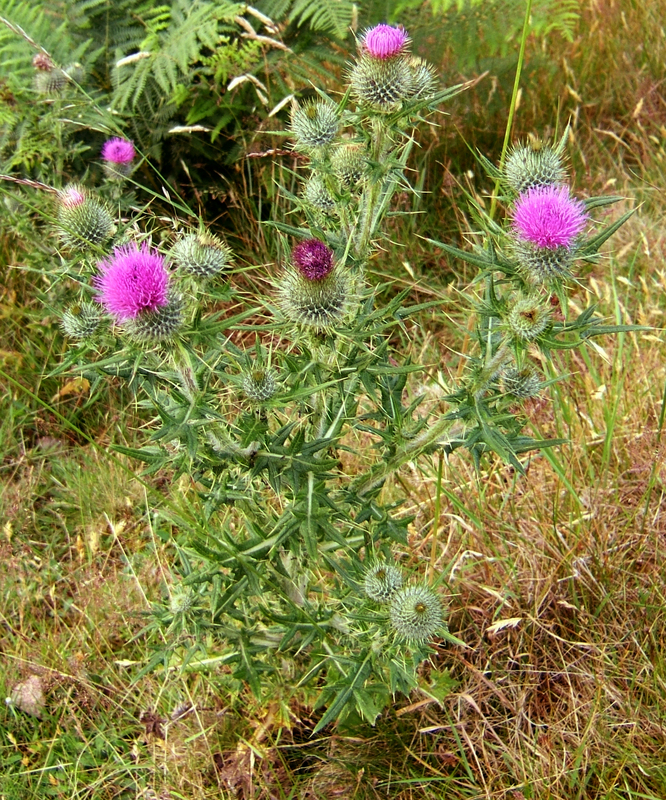 Cirsium vulgare is a biennial herb, to 50-150 cm tall, very hairy, stem spiny-winged from extended leaf bases, deeply taprooted. Leaves alternate, narrow, about 15 cm long, 5 cm wide but very variable, very spiny with irregular spine-tipped, toothed lobes, both sides hairy, first years leaves in an overwintering rosette. Flowers purple, all tubular, to 4 cm long, bracteate base of head 2.5-4 cm long to 4 cm wide, urn-shaped, bracts numerous, overlapping, spine-tipped, self-fertile (autogamous), (Mulligan and Kevan 1973); blooming June-Oct., flowers visited by bees and hummingbirds (Martin et al. 1951). Fruit dry 1-seeded achenes about 0.4 cm long, yellow-brown, black streaked, oblong, smooth (Levine 1995), white plumed, wind dispersed; winter plant pale tan, receptacle flat, densely bristly surrounded by spiny bracts of flower head. Seeds eaten by finches and other birds (Martin et al. 1951). Habitat: Open fields, roadsides, edges. Prefers rich, moist soil (Uva et al. 1997).